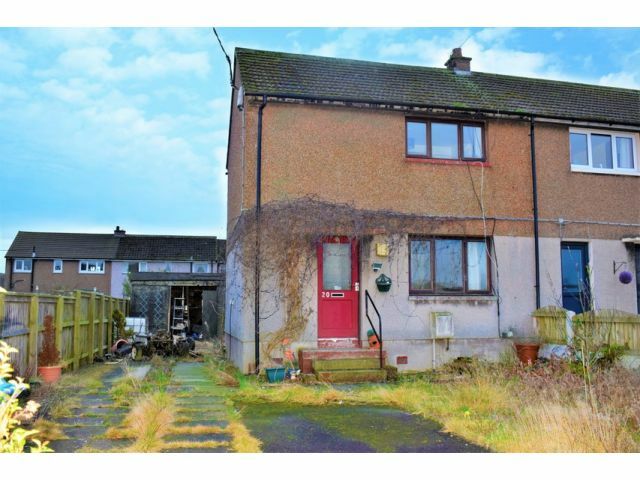 This two bedroom end terraced family home requires a degree of renovation and is located in the small village of Springfield on the outskirts of the township of Gretna, which has amenities including shops, Primary schooling and a GP Surgery and is ideally located for access to the M74 and A75. The accommodation comprises of Lounge, Kitchen with Generous Storage Cupboard. Upstairs there are Two Bedrooms and a modern Shower Room. Outside there is a generous amount of off road parking and gardens to the front and rear. We can arrange a FREE, no obligation valuation of your current property. Call us on 01461 205690 to arrange a day and time that's suitable for you! Ceiling light, telephone point. Electric radiator. Windows to front and rear with curtain pole and blinds. Recessed lighting, telephone point, TV point. Electric living flame fire set onto wooden surround. Two electric radiators. Window to rear. Ceiling light, extractor fan. Large walk in under stair storage cupboard. Wall and base units, stainless steel sink and drainer, tiled splashback. Plumbing for washing machine, space for drier and space for fridge freezer. Loft access. Ceiling light, smoke alarm, electric radiator. Window to front with curtain pole. Ceiling light, TV point, storage cupboard. Electric radiator. Window to rear with blinds. Ceiling light, TV point. Electric radiator. Opaque window to rear with curtain rail. Ceiling light, extractor fan, electric wall heater. Half perspex boarding, half tiled. Toilet, wash hand basin and walk in shower unit with electric shower. Vinyl flooring. Generous gardens requiring attention. Off road parking to front and side for several vehicles. Low maintenance garden to front. Large area to rear with low maintenance sections and large workshop / shed. Mains water, electricity, gas and mains drainage. By appointment only – please contact our office on 01461 205690 to arrange a time, suitable for you. Out of office hours (until 9pm) – 07742537220. Offers in the region of £65,000 are invited and should be submitted to lj Residential, 93 High Street, Annan, DG12 6DJ or by fax to: 01461 205037. The measurements are approximate, were taken with an electronic measuring device and are for guidance only. It is for prospective purchasers to investigate and satisfy themselves as to the basic facts before submitting an offer.